Today was the day that Kaila at TKB Trading said she would strive to be ready to ship the franken bases to international locations by. I got an email from Kaila first this this morning which let me know where she was at. "I made a commitment to you that I would sort out the issue of shipping our Frankenpolishes from the USA to overseas locations by 9/18/2011. I have also been promising domestic customers that I would sort out shipping larger than pint quantities. Originally, my thought was this would be a very straight forward process of me devoting a (lovely) Saturday to taking a six hour online required training in Haz Mat shipping. However, as I go through the training, I realize that I will also need to arrange for the proper packaging materials, labels, figure out which shipping company will be the most affordable for our customers, and etc. So my carving out a Saturday for this project isn't going to cut it. For now, I can tell you that I have begun my online training. And this coming week I will be sorting out the details with Fedex and UPS, as well as the supply companies for labels and what not. But I'm not going to meet the deadline." So while she hasn't got the franken suspension bases ready to go, I think it's awesome that she was committed enough to email me and let us know that she is working on it. You rock Kaila. Now on to some swatches. 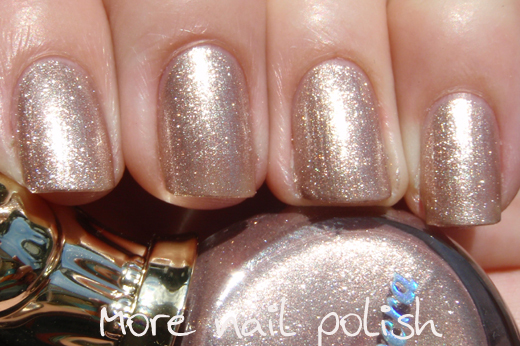 I'm back to my Peripera polishes that I was showing you, just before the spectraflair arrived. This is Peripera Crystal Brown. It's similar again to the two I have already shown, Crystal Gold and Crystal Beige. 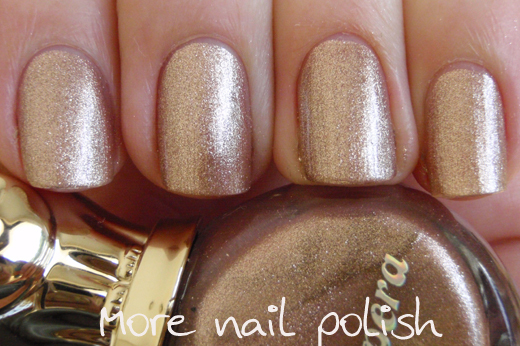 To me it has a slight pink tone, a little like a warm gold, but not quite a rose gold. Given it was called brown, I was expecting it to be much darker, but like I said in previous posts, I only had a colour dot on the computer screen to pick my colours by. 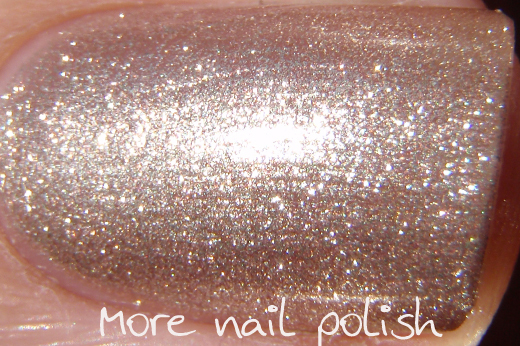 Amazing foil sparkle in the sun., but it also showed a little teeny tiny bit of streaking. But maybe it's just the macro shot you can really see it in. Now I think it was Tina who asked for some bottle pics. So better late than never right. The bottles are soooo awesome. Those little kitties on the top are so shiny and chrome like, that the sun is flaring off them. Is it just me that wanted to know what the back of the cats bum was like? Well this photo is bloody awful, but I can tell you there is a little indent between the two legs and other than that it is round. This cat's bum is fat - or maybe it's just extra fluffy! Oh good, I have a little more time to save my pennies for a TKB order :) Those bottles are super cute!! The bottles are super cute!! Thank you for the bottle picture! They are so cute! :)And lovely color! And thanks for letting us know about Kaila. I haven't really been following the suspension base thing. Could you tell us how we get in contact with her? Thanks a lot! 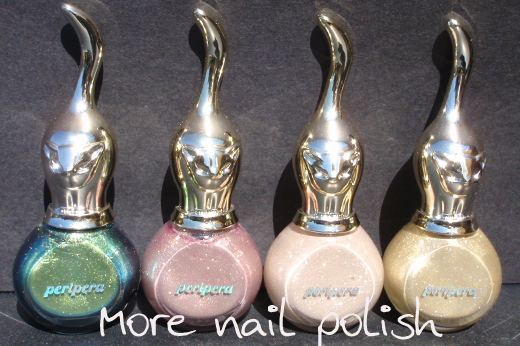 Such pretty polish bottles! I love them! 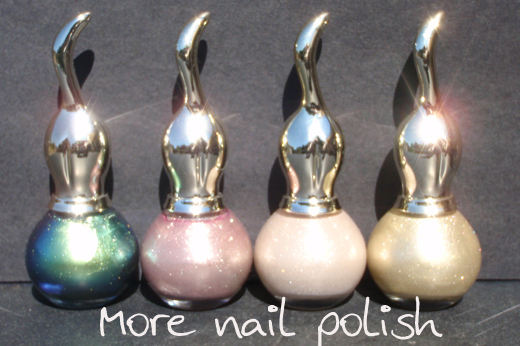 Such pretty colours but the bottles clinch the deal for me - kitties 4ever. I'm assuming the bottle second from right is Crystal Beige - it almost fooled me into thinking it was a white that was begging for - you guessed - spectraflair! Thanks everyone - yep these bottles are just the best ever. Like a kitty balancing on a ball. Love them, plus the polish is great too. idrinknailpolish - oh yes, blue-green duochrome is the best one, I saved it till last to show you. Gwenn - I'm sure your kitty is just fluffy too, not fat! Catkin - yep that's Crystal Beige, and my photo is a bit overexposed making it look whiter than it is. I think these might be too sparkly to add spectraflair too, although they might work diluted. Firstly I love your blog! And secondly, I have a question that I hope you can help me with. I live in the States and heard about Spectraflair on the nail board at Purseforum, so I immediately placed an order with a website out of the UK. I just received my package today (they mailed it in a regular mailing envelope that was so thin and flimsy I was incredibly shocked it didn't burst inside) and the baggie is smaller than the one I've seen pictured here on your site. I purchased two grams, and I received one baggie and what I would guess is maybe a teaspoon worth of Spectraflair. Does this sound like two grams to you? I cannot get my hands on a scale currently and I want to make sure I wasn't ripped off, as I paid quite a bit for it.